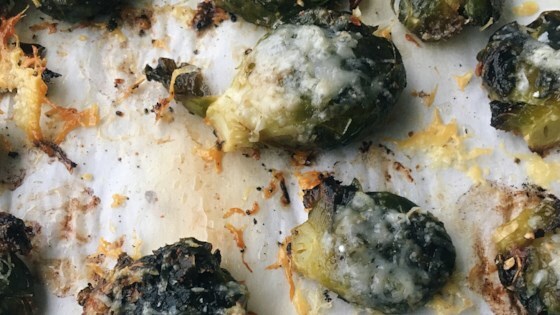 "Smashing Brussels sprouts and covering them with cheese guarantees lots of crispy, crunchy edges! Play with the seasonings and amount of cheese to suit your taste." Preheat the oven to 400 degrees F (200 degrees C). Line a baking sheet with parchment paper. Trim Brussels sprouts and discard any yellow outer leaves. Place a steamer insert into a saucepan and fill with water to just below the bottom of the steamer. Bring water to a boil. Add Brussels sprouts, cover, and steam until tender, about 10 minutes. Drain well, pat dry, and transfer to the baking sheet. Toss Brussels sprouts with olive oil, garlic powder, red pepper flakes, salt, and pepper. Spread out evenly on the baking sheet. Use a Mason jar or other heavy object to press Brussels sprouts into flat patties. Roast in the preheated oven for 15 minutes. Cover with Parmesan cheese. Broil until cheese starts to brown, about 2 minutes. I love brussel sprouts, so a new way of fixing them is great!!! Quick, easy, and good. Definitely will make again.